I tried a different approach to Slope Soaring (with some engine assist) and changed my launch position on the hill I fly on. The idea was to keep the plane to the north of me, away from the 'top' of the hill. Unfortunately there be houses over there. The Radian Pro got away from me and tried to fly under someone's deck. I had to knock on some doors, but the residents were ok with me going into their back yards to look for and retrieve the plane. That's the very reason i glued some thin 1mm carbon rod on all my leading edges and put extreme tape in strategic locations. First flight I lost control and hit a tree hard and then the ground. Plane was not hurt at all. The plane was brand new but don't be hesitant on adding reinforcement. Looks like an easy fix at least. The Fuselage also broke about 2" forward of the tail. I went an bought another Radian Pro, since the prior crash killed the ESC, and this crash shattered the canopy. I've repaired the old fuselage, swapped out the ESC and installed the new wings. I'm ready to fly again. When I got the crashed (and bashed) wings off, it's clear I can repair them, and will do so as a back up. The wings broke at the end of the carbon rod, and the brake went clear through the Ailerons. There is a crushed area outboard of the break. So my strategy is swap out parts as needed between the newer model and the one I'm using to learn on. Since the Radian Pro ESC was taken out by the prior crash, I swapped it for an ESC that I had in my Zagi. I believe I got into trouble partly because of the Zagi ESC not being a good match. I tried to turn into the wind and power my way out of the danger zone, but I couldn't make that happen, so the plane just kept going parallel to the hill, over houses away from me. I was very afraid of causing a dive into a street, or someone's house, so I tried to keep it over yards when I could. The carbon on the leading edge is a great idea, and next time I'm at a hobby store, I'll pick some up. Then get the hang of it. Revisit the slopes once you are comfortable flying her in easier conditions. Also, kinda hard to judge from the photo, but I have to agree with the previous poster that your plane was almost certainly fixable with little more than glue and carbon. It wouldnt look as nice, but thats actually a benefit if you are still prone to crashing . For me, 'Learning to Fly' is a lifelong effort. So I'm not 'just' learning to fly. My goal is to eventually own an RC plane like the one I built 20 years ago and crashed between the double yellow on the road at a place I call 'Rattlesnake Hill'. I flew that plane for about a year before I tried to get one more flight with a battery that was too low. It was a sweet plane, and I still have the wing. It delaminated in one particular area, and I feel I could probably inject some resin and build another fuse. That's a future project. That was then, this is now. That plane had a wing with a fiberglass skin over a foam core and a scratch built 'contest balsa' fuse. It was similar to the ASK-21 in wing plan. I could float it in a 5 mph breath of air coming up the slope, or I could ballast it and fly it in a 20mph wind. My skills from back then are gone and I'm 'Learning to Fly' to get them back. I'm convinced that is why I lost it. When the air is below 10 mph, fly the Radian UMX . . .
instead of the Radian Pro there. I will eventually fix the wings. 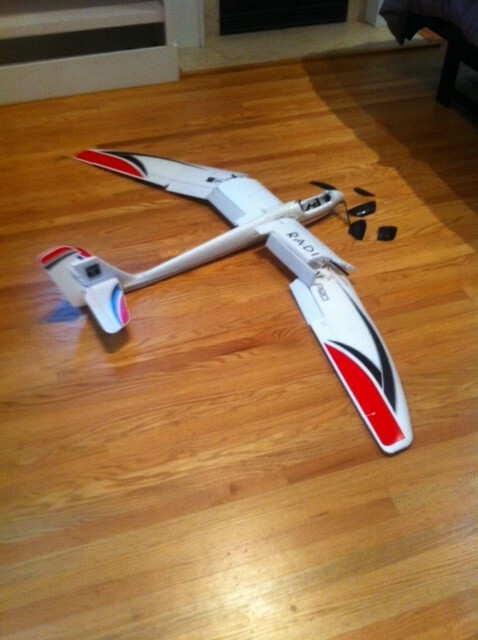 To get back out fast, I bought another Radian Pro, fixed the Fuselage, put the new ESC and Canopy and wings on it. That gives me a spare Fuselage, with motor, Rx, servos and horizontal stabilizer. I'll probably buy a third Radian Pro, so I have a pristine pair of wings. I will eventually fix the broken wings and put the ones I'm using now on the shelf for later. I'm very committed to get as much practice in with the Radian Pro to learn all the things that are involved with RC flight, from Batteries, to Mixing, to Flight, to restoring broken pieces to 'like new' condition. I'm following #3 above. Went to the Berkeley Marina with the brand new wings, flew until the spinner came off (that's never happened before!) - Realized I need to organize an RC tool kit. So went to a nearby Hardware Store, got a set of jeweler's screwdrivers and a zippered cloth bag and added the other loose tools I already had to the bag. Put it in a backpack and headed back to the Marina after putting the spinner back on. Flew until the ESC low voltage alarm went off, then put in Battery #2. By that time it was getting windy, so windy that the plane would fly backwards without the throttle on. Spent all my time practicing landings. I need to be more comfortable with tight turns in wind and dropping altitude in wind to land. Got a lot of that today with zero damage to the brand new wings. Some of my landings are a bit hard on the fuselage, but I have to pass through this part of the learning curve. It would be nice if I had a flat field of grass, with steady wind conditions, but this is what I've got and I had to learn to fly in it.